Gallia Academy freshman Ryelee Sipple takes a sign from the dugout during the Blue Angels’ victory over Rock Hill on April 9 in Centenary, Ohio. THE PLAINS, Ohio — Runs galore. The Gallia Academy softball team scored a combined total of 25 runs in their doubleheader with Athens, as they earned a 16-12 victory in the opening contest and 10-9 defeat in the finale on Saturday in Athens County. In the opener, Gallia Academy (14-3) leaped to a 1-0 lead in the top of the first, as Ryelee Sipple provided a solo home run with one out in the inning. The Lady Bulldogs countered in the bottom of the first, with a two-run home run by Casto to take a 2-1 advantage. The Blue Angels regained the lead in the top of the second, as Alex Barnes, Bailey Meadows, Chasity Adams and Hunter Copley each scored in the frame to stake the visitors to a 5-2 advantage. AHS continued the seesaw exchange in the bottom of the second, as they plated five runs to take a 7-5 lead. GAHS countered in the third, as it sent nine hitters to the plate and manufactured four runs on five hits, to take build a lead of 9-7. Athens tied the contest at 9-all in the bottom of the third, as it produced two runs on two hits and an error by Gallia Academy. The Blue Angels broke the deadlock in the fourth, as Sipple, Meadows, Adams and Copley each scored in the inning to propel GAHS to its fourth lead of the contest at 13-9. The Lady Bulldogs narrowed the margin to 13-11 in the bottom of the fourth, as Sikorski lead off with a walk and Thomas followed with a single then scored on a two-out error by Gallia Academy. The Blue and White extended it’s lead in the fifth, by way of a two-run home run off of the bat of Sipple’s second — her second of the contest — to take a 15-11 advantage. 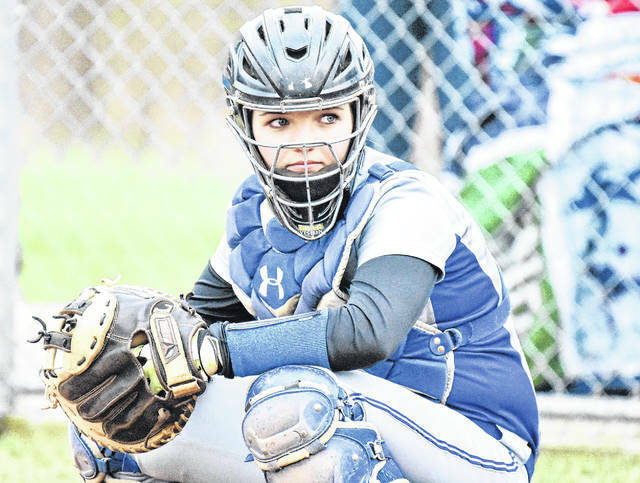 Gallia Academy furthered its advantage to 16-11 in the sixth, as Hailey Jo Ehman reached on a single and later scored on a single by Bailey Young. Athens added one run in the seventh, as GAHS closed out the 16-12 victory. Bailey Young was the winning pitcher of record in game one, as she worked seven innings, allowing 12 runs on 13 hits, with two walks and five strikeouts. Young also finished with two safeties, one RBI and scored twice on offense. Copley and Allie Young each finished with three hits to lead the Blue Angels at the plate. Copley also had three RBI and scored three times, while Young drove in two runs and scored once in the contest. Sipple was next with two hits – a pair of home runs — and provided three RBI while scoring three runs. Barnes and Adams finished with two safeties apiece, respectively. Barnes also scored once, while Adams provided a pair of RBI and scored twice in the opener. Ehman finished with one hit an one run scored to concluded the offensive totals for GAHS in game one. In the finale, Gallia Academy trailed Athens 3-0 until the top of the third inning, as a three-run blast by Sipple knotted the game at 3-all. Athens regained the advantage in the bottom of the third, as Casto led off with a single and later scored on a single by Sikorski to take a 4-3 lead. AHS added an additional run in the fourth, but GAHS countered in the top of the fifth to tie the contest at 5-all. Athens countered in the bottom half of the fifth, as an single by Stewart drove in Carey to give the hosts a 6-5 lead. GAHS erupted for four runs in the sixth, as an RBI-single by Sipple and three-run home run by Barnes staked the Blue and White to a 9-6 advantage entering the final frame. The Lady Bulldogs rallied in the seventh, as they sent sent eight hitters to the plate in the inning and manufactured four runs on five hits and a walk to earn a 10-5 walk-off victory. Meadows suffered the pitching loss for GAHS, as she surrendered four runs on six hits, with one walk in 1⅔ innings of work. Meadows also provided one RBI in the contest. Copley started the contest and pitched five innings, allowing six runs on nine hits with three walks and six strikeouts. Copley also had two hits at the plate. Sipple led GAHS at the plate in the finale, as she provided three hits, four RBI and scored three runs. Barnes was next with two hits, four runs batted in and scored once. Bailey Young also had two safeties and scored twice. Unroe added two safeties and two runs scored, while Allie Young had one hit and scored once to close out the offensive totals for the Blue Angels in game two.